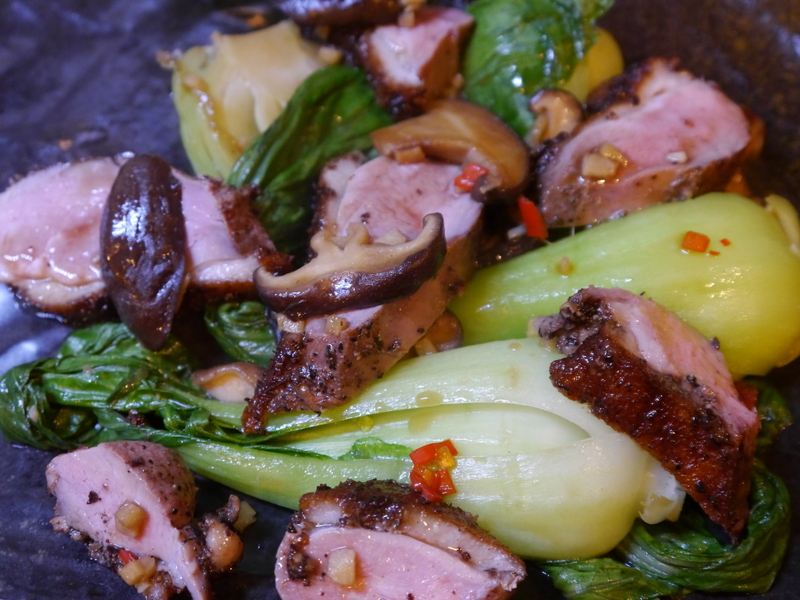 When cooking with duck breasts I normally choose to French flavours and accompaniments but after buying so many green Asian vegetables last weekend I went with Asian flavours. If you remember to get organised, it’s good to marinate the duck breasts overnight. The night before, using a mortar and pestle crush both types of peppercorns and mix in the salt. Using a sharp knife make crisscross cuts into the duck breast skin and fat. Try not to cut into the flesh. Place the breasts in a dish and pour over the dry sherry. Rub both side of each breast with the pepper and salt blend. Cover the dish and leave in the fridge. The next day heat a heavy frying pan over a medium heat. Pat the duck breasts dry with paper towels. Place the breasts skin side down in the pan. The skin of each needs to brown and go crispy but not burn. Lots of fat will come out of the skin. Cook for about 5-8 minutes. Remove the duck, pour off the fat and return the pan to the heat. Return the breasts to the pan flesh side down. Cook for another 5-8 minutes depending on the thickness of the duck. Once done remove the duck, cover and leave to rest for up to 10 minutes. While the duck is resting cook the vegetables. Heat a pan with a little oil. Add the shitakes and cook till soft – add a couple of tablespoons of water and cover the pan (keep the heat high). Add the garlic, ginger, chilli, bok choy and sesame oil. Cook for a minute or two till the bok choy wilts. Mix together the stock, soy, oyster sauce and sugar and add to the vegetables. Simmer for 2-3 minutes while it reduces and thickens a little. Slice the duck breasts diagonally and serve on the vegetables. I served this with steamed rice.